The NPK® CORE CHISEL has a hard steel core and its pencil shape provides extra hardness where it is required – at the point of impact. Low in wear rate and long in service life, the NPK® CORE CHISEL gives pinpoint accuracy at the contact point, every time! The benefit being lower replacement costs! With its hard centre, the chisel point is kept ever-sharp. The peripherical sleeve surrounding the core wears at a faster rate, ensuring the chisel point remains sharp and thereby delivering maximum impact and penetration at the contact point. The benefit being improved work efficiency. Unlike its competitors, the NPK® CORE CHISELS hardness and efficiency does not decrease when the chisel point temperature begins to rise. 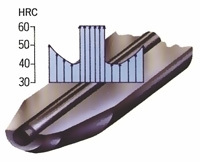 Standard hammer work can produce a temperature at the chisel point of nearly 550°C. This heat can greatly affect the chisel as it begins to cool, with significant changes occurring in hardness and impact efficiency. The new NPK® CORE CHISEL with its revolutionary steel core, experiences less temperature change and consequently minimum hardness variations, making it the most powerful chisel available. The benefit being increased productivity! The NPK® CORE CHISEL with its revolutionary steel core, provides extra hardness where it is required: at the point of impact. The benefit being less wear, increased productivity and lower replacement costs! With its hard centre, the chisel point is kept ever sharp. The material surrounding the core wears at a faster rate, ensuring the chisel point remains sharp and thereby delivering maximum impact and penetration at the contact point. Unlike its competitors, the NPK® CORE CHISEL’s hardness and efficiency does not when decrease the chisel point temperature begins to rise. Standard chisels can produce a temperature at the chisel point of nearly 550°C which can greatly affect the hardness and impact energy as it cools down. The NPK® CORE CHISEL experiences less temperature change and consequently minimum hardness variations, making it the most powerful chisel available. Like the normal Chisel(P) the NPK® CORE CHISEL is most suitable for concrete breaking, high- way construction and general demolition.